"Not a cover up, just evolvin." If there's one thing we know for sure, it's that Ariana Grande is a big fan of tattoos. I'm sure I don't need to remind you of the Japanese BBQ tattoo saga. So it's no surprise that, while Ariana was dating Pete Davidson, both of them added tattoos dedicated to their relationship to their already extensive collections. After they ended their engagement last October, both Pete and Ariana jumped to start covering their couple tattoos. Ariana covered the tiny inking of Pete's name on her ring finger with a black heart. Pete also opted for a black heart to cover his tattoo of Ariana's iconic Dangerous Woman logo, while Ariana covered another tattoo she'd had dedicated to Pete with a tribute to her ex-boyfriend Mac Miller. Well, you may remember that last month, Pete covered up a tattoo he'd originally had to match one of Ariana's with the word "cursed". But it turns out the one next to it — "always" — was a tribute to Ariana too, who also had the word tattooed on her ribs. At the time, fans speculated that they had the word written in each other's handwriting, and that it was a Harry Potter reference, which both Ariana and Pete are obsessed with. if he covered his ariana tattoo with cursed? 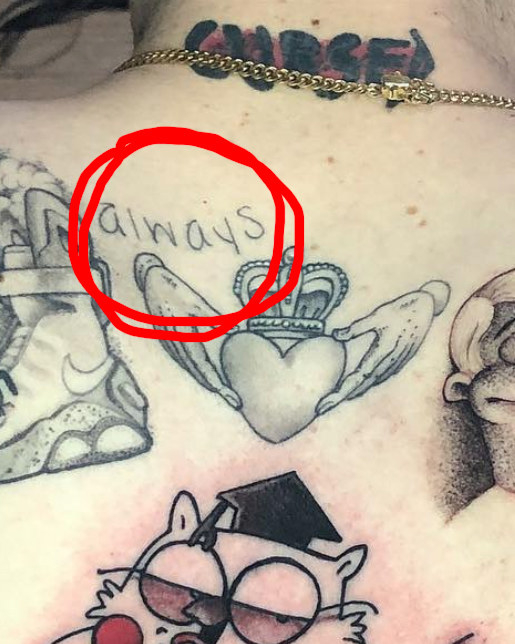 then why does he still have a tattoo of ‘always’ written in her handwriting? But it looks like Ariana's officially ending that chapter of her life. Yesterday, she posted a photo to Instagram announcing she was having a middle-of-the-night tattoo session. But she's not covering the tattoo — she's embellished it, adding an outline of some leaves around the word. And in the caption, Ariana wrote that the original tattoo was simply evolving.